This Sony home theatre system looks the business, but can it cut the audio mustard? 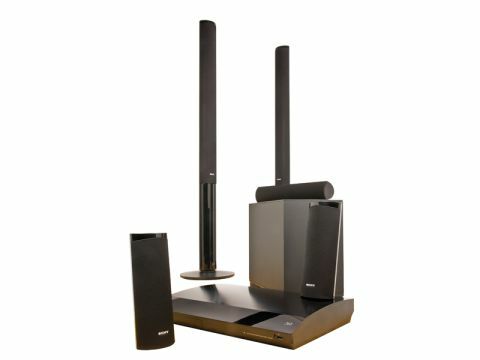 Sony's BDV-E880, costs merely £400 and comprises a 5.1 Blu-ray home theatre system with 3D support and Sony's Bravia Internet Video Smart TV platform. Inside the box you find a pair of 25cm-tall surround speakers, a long skinny centre-channel cabinet and two alarmingly large tower speakers for the front left and right. They dominated my cabinet-mounted 40-inch TV, so owners of smaller screens take note. A downward-firing subwoofer, a connectable iPod dock and the main unit complete the lineup. The latter is a real design hit, with a sloping top panel and illuminated transport controls. It doesn't weigh much, but build quality seems solid. The back of the player/amp features two HDMI inputs, ARC-capable output, LAN port, digital and analogue audio inputs and jacks for the FM antenna and dinky mic that Sony provides to assist speaker setup. Wireless 'net connection is possible via the front-mounted USB port, but requires the purchase of an adaptor. My tests were done wired. I ran into a few problems with the BDV-E880 when running a set-top box through it, as none of the audio options are viewable on screen when you're using the HDMI inputs. You have to use the main unit's front display and the unintuitive handset. But once I managed to get the system to output TV material in pure stereo sound, the audio from the gangly towers and the subwoofer proved adequate for telly addicts. The performance boost over a contemporary flatscreen is immediately obvious, with the sub adding a decent low-end to the clean dialogue presentation. However, the sound lacks the warmth and body you get from separate home cinema speakers, and quality begins to suffer as you ramp up the volume. Moving from TV material to a BD makes operation far easier, as tweaks can then be done on the BDV-E880's screen. You can experiment with a variety of modes such as Hall, Night, Omni-Dir, and Sports. There's also a 3D Surround option for when you're watching 3D Blu-rays. With the DTS-HD Master Audio mix of Sucker Punch, the surround speakers show their strengths, filling out the soundfield with high-frequency effects and matching the tonality of the tallboy fronts. But it is still very treble-heavy, and watching the movie's bombastic fight scenes became quite tiring on the ears. The sub, meanwhile, could do with tightening up and going louder, too. All these niggles result in a very average audio performance at best. The BDV-E880's video performance is worthy of more praise, with BDs (both 2D and 3D) coming across with typical sharpness and colour vibrancy. Nor can I find fault with the system's net functions. Bravia Internet Video is paradise for VOD lovers, with worthy services such as Moshcam (live music concerts) and Qriocity alongside the stalwarts of LOVEFiLM, BBC iPlayer and YouTube. Overall, the BDV-E880 is somewhat unsatisfying. Stylistically, it's certainly one of the best home cinema options around, and the range of features on offer (bar the lack of built-in Wi-Fi ) will turn any living room into a Smart environment. However, you could as easily get all those goodies from one of Sony's affordable standalone Blu-ray players, and pair it with a superior amp/speaker combo.